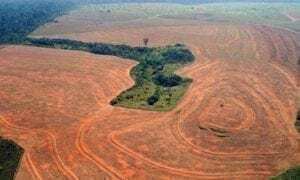 Brazil’s Amazon rainforest is under siege as large-scale hydroelectric projects and small-scale land speculation portend a sharp rise in deforestation rates and massive environmental degradation. Thirsty for energy to drive economic growth, Brazil has plans to build 60 dam systems in the Amazon region over the next 20 years, according to Belo-Monte.com. Meanwhile, rising land prices are making it more attractive for people from other parts of Brazil to migrate to the region to clear and claim land for quick resale to business interests, according to researchers, community and environmental groups. Ground has been broken for construction of what would be the world’s third-largest hydroelectric system, the Belo Monte dam, even as opposition groups continue to protest its construction. The mega-infrastructure project is seen as “the thin edge of a wedge” that will see the Amazon’s rivers largely drained and the tropical rain forest ecosystem severely degraded, resulting in staggering losses of freshwater fish, amphibians and terrestrial wildlife, as well the traditional ways of life of thousands living in the region. Adding to the threat of increasing deforestation pressure are small-scale land speculators from southern Brazil who are moving into Amazonas state and clearing forest areas in order to claim title and sell the land on to large corporate ranchers, according to a new research study.The Folly of Belo Monte? After twenty years of moving forward and backward, Brazil’s Ibama environmental agency gave final approval for the estimated $19-billion Belo Monte dam project on June 1. Building it will devastate 1,500 square kilometers of tropical Amazonian rainforest, an ecosystem that has sustained local populations for thousands of years, resulting in the death of millions of tropical rainforest animals and a staggering loss of biodiversity, according to opposition groups. Estimates of the number of people displaced and affected range from a low government estimate of 19,000 to an independent Brazilian research group’s estimate of some 40,000. Included is wiping out the “Big Bend,” a 62-mile stretch of the Amazon tributary Xingu River, and reducing the Amazon tributary’s overall flow by 80%,according to a 230-page report completed by an independent panel of 40 specialists looking to evaluate the true costs of the project. Characterizing the project as “The Folly of Belo Monte,” the research group concluded that Belo Monte would be the most inefficient dam ever built in Brazil. Though Belo Monte’s estimated electricity generation capacity is 11,200 MW, the hydroelectric dam system would actually generate only 40% of that, dropping to a low of 10% during the July to October dry season, they say. Belo Monte will produce much more greenhouse gases, specifically methane, than the project’s Environmental Impact Assessment (EIA) projects, notes Philip Fearnside, ecologist for the National Institute for Amazon Research (INPA). In response to the project moving forward, AmazonWatch and other human rights and environmental groups are organizing an “International Day of Action to Defend the Brazilian Amazon” on August 22. Another growing threat to the Amazon river and rainforest and ecosystem is growing small-scale land speculation, according to, “Forest Clearing Dynamics and the Expansion of Landholdings in Apuí, a Deforestation Hotspot on Brazil’s Transamazon Highway.” The study found that many families that had moved into the area earned, or were looking to earn, income from claiming title to the land by cutting and clearing forest and then reselling to large corporate ranchers. “These families are always moving into new forest areas to deforest so they can claim land title. And after a few years they sell it for a much higher price,” co-author Gabriel Carrero of the Institute for Conservation and Sustainable Development of Amazonas (IDESAM) was quoted as saying in this IPS News report by Stephen Leahy. The population of Apui has tripled since the early 1990s, the report notes, and the municipality has had some of the highest rates of deforestation in Amazonas state. Some 90% of what was forest is now pasture. Carrero and co-author Philip Fearnside of the National Institute for Research in Amazonia (INPA) found that road building and associated infrastructure was the primary driver of deforestation, as it opens up previously inaccessible forest areas. “Access to the unclaimed forest land follows roads. When roads and other infrastructure improve, land values jump, facilitating speculation,” he said. Deforestation produces 2.9 billion tons of carbon into the atmosphere every year, according to the first detailed calculation published 15 July in the journal Science, Leahy notes. “For comparison, total yearly emissions from all fossil fuels (coal, gas, oil) plus production of cement are just under 8 billion tons,” he wrote. Great article, detailing how this project will destroy animal habitat and accelerate global warming. What’s most striking is how the economic system works against the environment, often with the support of the government. We need these three to work together if we are to survive and thrive. I like the name of your website, too. That global warming is real is certainly true, and sneaking Israel into the URL will surely trick conservatives into visiting! Yes, the conservatives do come in here and let me know what they think. And they’re generally so polite about it too… Thanks for the comment and check back often! Andrew does an great job and posts every Tuesday – and we’ve got other great contributors here too that you might find interesting. screen in Safari. I’m not sure if this is a formatting issue or something to do wit? web browser compatibility but I fi?u?ed I’d post to let you know. Thanks for the heads up! We’re looking into it.